Over the past quarter century, the Central Park Conservancy has supported numerous archaeological explorations in that exceptional rectangle of urban recreational land under its care in the heart of Manhattan. It may come as a surprise that the creation of the Park in the late 1850s and early 1860s, and its subsequent upkeep, have far from removed all trace of earlier land use within its limits. 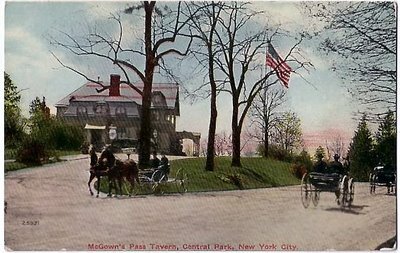 Historical and archaeological studies performed both in advance of landscaping improvements and as pure research endeavors have revealed unexpected evidence of Central Park’s pre-park history. The Kingsbridge Road (the old post road from New York to Albany and Boston), the military installations of the Revolutionary War and the War of 1812, the occupation of the early 19th-century African-American and Irish settlement of Seneca Village, and the surveying of the Manhattan street grid by John Randel – there are tangible below-ground expressions of all of these and more in Central Park’s archaeological record. This talk offers a brief illustrated overview of recent archaeological discoveries within the Park placing them in their historical and modern contexts. Richard Hunter is founder and President of Hunter Research, a historical and archaeological consulting firm based in Trenton, New Jersey. He holds a Ph.D. in geography from Rutgers University, an MA in archaeological science from Bradford University, England, and a BA in archaeology and geography from Birmingham University, England. He has worked as an archaeological and historic preservation consultant in the Middle Atlantic region since 1977, serving on the New Jersey Historic Sites Review Board, as President of Preservation New Jersey and as Chair of the Trenton Downtown Association. His firm Hunter Research has provided historical and archaeological expertise to the Central Park Conservancy since 1990 and has conducted numerous studies elsewhere in New York City, including on Ellis Island and Liberty Island and in City Hall Park.